Selecting a mover is one of the crucial elements of your move, one which your entire moving experience can depend on. If you search the Internet or the Yellow Pages for moving companies, you will be overwhelmed by the sheer number. How do you narrow this large number to a selected few? You look for quality. How do you recognize quality? It’s through the FIDI-FAIM certification. FIDI is the largest global alliance of independent quality international removal companies. To get this certification is not an easy task as the FIDI-FAIM certified movers have to pass through a gruelling quality compliance procedure and earn the right to be a part of the FIDI network. These quality certifications are granted to us after strict compliance and evaluation of the standards prescribed by Cap Gemini Ernst & Young Consulting and thus assures a very professional and reliable service. Star Worldwide Group, Corporate office is FIDI FAIMPLUS certified. Our current FIDI FAIM accredited branches include Star Worldwide Group, Mumbai and Star Worldwide Group, Bangalore. OMNI (Overseas Moving Network International) is a global network of the world's leading international relocation and moving specialists. OMNI companies are market leaders in their own countries that have joined together to provide a network of excellence worldwide providing the best service the industry can offer. The close working relationships amongst the OMNI trading partners are built on personal and professional trust in each-other's competence, integrity and local knowledge. Unlike multinational moving giants, OMNI partners work together out of choice not obligation. This ensures that each company maintains the desire to provide excellent service and that only the world's finest companies remain part of the network. BSI Group is the leading global independent business services organization that inspires confidence and delivers assurance to customers with standards-based solutions. We are the leading global provider of management systems assessment and certification solutions. ISO 9001 is by far the world’s most established quality framework. It can help bring out the best in your organization by enabling you to understand your processes for delivering your products/services to your customers. ISO 9001 is suitable for any organization looking to improve the way it is operated and managed, regardless of size or sector. ISO 14001 is an internationally accepted standard that sets out how you can go about putting in place an effective Environmental Management System (EMS). The standard is designed to address the delicate balance between maintaining profitability and reducing environmental impact; with the commitment of your entire organization, it can enable you to achieve both objectives. BS OHSAS 18001 is the internationally recognized assessment specification for occupational health and safety management systems.BS OHSAS 18001 has been designed to be compatible with ISO 9001 and ISO 14001, to help your organization meet their health and safety obligations in an efficient manner. BS OHSAS 18001 can be adopted by any organization wishing to implement a formal procedure to reduce the risks associated with health and safety in the working environment for employees, customers and the general public. ARTIM is an annual meeting of the world’s leading fine art logistics companies who provide museum quality fine art packing, transport, shipping, storage and installation services for Museums, Galleries, Dealers, Corporate & Private Collectors and Auction Houses. ARTIM provides a forum where the premier fine art logistics companies from each region of the world meet to discuss the key business issues concerning the packing, transportation and movement of works of art. 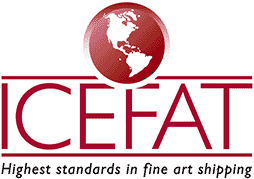 ICEFAT, International Convention of Exhibition and Fine Art Transporters, is dedicated to promoting the highest standards of professionalism in the field of museum and gallery shipping. It strives to foster effective communication and understanding between the members and the clients by providing an information network which allows for competitive alternatives in the area of art transportation. Acceptance of the membership indicated the applicant has been judged on the basis of the strict quality parameters. Harmony is the largest commonly branded global network of relocation companies. The network (founded in 1992) consists of over 140 members in 60 countries, serving 180 countries across 6 continents, providing the same level of high quality services, local expertise and personal commitment. The Harmony network is brought together as one truly global and solid infrastructure with cutting edge technology, an ISO-tested quality system and leading sustainability criteria. IAM, International Association of Movers, the moving and forwarding industry’s largest global trade association, is a union comprised of auditing, forwarding, moving, and shipping companies located in over 160 countries. It is a global association of movers and forwarders committed to providing customers with the highest level of service available. As a member of the International Association of Movers it allows to join a global fraternity of transportation provider executives and managers, which will aid you and your organization in the multinational transportation services arena. Air transport is one of the most dynamic industries in the world. The International Air Transport Association (IATA) is its global trade organization whose prime vehicle for inter-airline cooperation in promoting safe, reliable, secure and economical air services - for the benefit of the world's consumers. IATA’s aim is to help airlines help themselves by simplifying processes and increasing passenger convenience while reducing costs and improving efficiency. We are a Relocation, Fine Art Handling, Event &AMP Exhibition Logistic and Information Management service provider. © Star Worldwide Group Private Limited.